Chris B. - Black powder is really just a mixture. It's a mixture of charcoal, sulphur and so-called saltpetre or potassium nitrate, and it works because the saltpetre, the potassium nitrate acts at a very concentrated source of oxygen. So the carbon in the charcoal and the sulphur, instead of burning in the oxygen from the air, they burn and they built in oxygen in the potassium nitrate and so, it's a much more concentrated form of oxygen, therefore, a much more concentrated and intense combustion. Chris - So if I light it, what happens? Does it immediately go bang? Chris B. - Not quite. What happens is that the ingredients first of all have to melt so that the molecules can come into contact with each other. The potassium nitrate has to start to decompose. It needs a certain amount of heat to get it going and then the chemical reactions can take place. They are essentially reactions of burning so the carbon in the charcoal will burn with oxygen from the potassium nitrate to make carbon dioxide and release energy for example. And we can try it here if you like. I've got 1.5 grams of a good quality commercially gun powder and we'll see what happens when I just light a pile of this gun powder in the open. Chris - A lot of smoke, but it wasn't a bang. Chris B. - No bang. So what we have there was a very, very rapid burning. The technical term we give that is deflagration, but it just means burning. What's happening is, imagine a trail of gun powder and setting fire to one end. As the gun powder at one end burns, it generates heat and that heat raises the temperature of the bit of gun powder next to it in the trail. When that gets hot enough, that in turn will combust. And so, it's a process of propagation involving the transfer of heat. It's a relatively slow process. In that case, there's no explosion at all. If we actually want to get a bang, if we want to get a proper explosion, we need to speed things up. Chris - So when Guy Fawkes shoved tons of gun powder under the houses of parliament - hoping to blow it up - would that not have worked then because it was just a pile of gun powder, rather like you had there. Chris B. - Well of course it was in a cellar and surrounded by very thick stone walls. So it would've been very well confined. So I think there's little doubt that it would've resulted in an enormous explosion and a complete destruction of the House of Lords, yes. Chris - So is that how explosives involving gun powder actually work then, you confine the explosion? Chris B. - That's right. So if you're listening to a fireworks display, and you're listening to all the bangs, it will be gun powder or another type of low explosive that's been confined in order to produce the bang. Again, we can illustrate that here because I've got another sample. It's again 1.5 grams of gun powder. It's exactly the same type as before but this time, I put it into a cardboard tube and bound it up very tightly with tape. So it's very strongly confined and what we'll do is we'll set this off using a little electrical igniter that's buried inside the gun powder. Chris - I'll should put on some ear defenders. Chris B. - Okay, ready? Here we go. Chris - Okay, my ear is ringing even though I had the ear defenders on. That was exactly the same amount of gun powder we lit that went puff before, but that's the power of confinement. You get that huge bang. Chris B. - That's right. That's dramatically different, but it's still a very rapid burning. So what's happening is that as the gun powder starts to burn, it releases energy in the form of heat, but that heat is now trapped. It can't just escape. And so, the temperature rises and chemical reactions go faster at higher temperature. So, as the temperature increases, the rate of reaction increases, and so, the rate of heat production increases, this in turn raises the temperature. We have a positive feedback loop leading to a runaway reaction which resulted this explosion. For many years, perhaps a thousand years, that was really the only kind of explosive that people had. And then some time around the middle of the 19th century, people began to discover new kinds of explosives, so-called high explosives. Chris - Fundamentally, why are they different to gun powder? Chris B. - The key difference is the way in which they are initiated. So gun powder undergoes this very rapid burning. High explosives - something like nitro-glycerine or TNT - decomposes by a process called detonation which is a very different physical process and it's very much faster, and very much more powerful, because the oxygen is "built in" to the same molecule. So in a molecule of let's say, nitro-glycerine, you have the carbon and the hydrogen. We also have the oxygen and the nitrogen. That's the most perfect mix you can have between the fuel and oxygen. The carbon can combine very readily with the oxygen to make carbon dioxide. The hydrogen can combine with oxygen to make water. The nitrogen is left over. 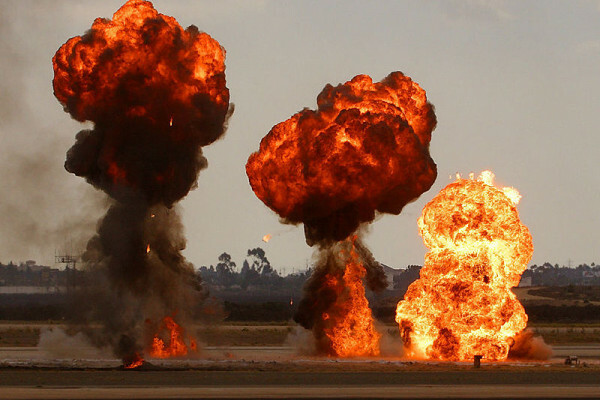 Nitrogen occurs a lot of explosives. It's very important because nitrogen gas in the air, consists of molecules containing two atoms joined together by one of the strongest bonds in chemistry. So if two atoms of nitrogen get together to make a molecule, they release a lot of energy. That's one of the reasons why high explosives release so much energy. Chris - But when we want to make it blow up, what do you need to do for that? Chris B. - So what we need to do then is to send in a very fast shockwave in order to get the explosive to detonate. So, a detonation is where a shockwave is traveling through the explosive, very much faster than the speed of sound. So this modern high explosive would detonate at the speed of about 8,000 metres per second. Chris - Gosh! So that shockwave is putting energy into the chemical bonds in the mixture, breaking some of them and making others recombine which then makes a bigger shockwave which then goes on to the next bit of the molecule, and you get a sort of explosive domino effect for want of a better expression. Chris B. - Yes, exactly right. It's the energy released by the high explosive which sustains that shockwave. If you sent a supersonic shockwave into a block of material, it would rapidly slow down to the speed of sound. But if the materials are high explosives, because it's detonating or releasing energy, that energy just behind the shock front is sustaining the shock front and keeping it going at that supersonic speed. So, one of the things I really want to do in the lecture is to try to give people a sort of visceral feeling for just how fast the detonation occurs. So I came up with the idea of using something called shock tubing. So I've got some shock tubing here and it looks just like a piece of yellow plastic tubing, 3 mm across. It's got a 1 mm diameter hole down in the middle and inside, it contains a very light dusting of high explosive called HMX. This is one of the most powerful explosives known and what I can do now is to demonstrate a shockwave traveling down the tube. Chris - This little piece of plastic tube is about 20 cm. What are you going to use to detonate it? Chris B. - What I'm doing is plugging it into an initiator which is essentially an electrical device. It has a couple of buttons. I press the first button which will charge up a capacitor. When I press the second button, it would produce a spark and that's enough to initiate the shockwave. Chris - I certainly didn't miss that. And you could see the flash go down the tube. Chris B. - That's right. But of course, at such a high speed, it appears to be essentially instantaneous. So, what we'll be doing in the lecture is to use half a kilometre of shock tubing and this is being wound as you see around the walls of the lecture theatre, so we'll go around the audience 4 or 5 times and then what we're doing is to initiate one end of the shock tubing and about a quarter of a second later, the shockwave will arrive at the other end. What I'm hoping is the audience will actually be able to perceive the delay between the start of the shockwave and the end of the shockwave, and might even be able to see this pulse of light racing around their heads several times. Chris - Has anyone ever tried to blow up a lecture theatre in this way in the past? Chris B. - I'm certainly hoping not to blow up the lecture theatre! But I think it's the first time, as far as I know, that somebody has tried to use this sort of method to illustrate the speed of detonation as a live demonstration in a lecture theatre. Chris - And I'm pleased to say, it definitely worked. People reported seeing the explosion whirl around their heads. So well done to Professor Chris Bishop with a first of its kind demonstration, surrounded the audience with high explosives. Next Have we found the Higgs Boson? What do you need to make a firework?